SER Furniture Ltd. was formed from a dedicated team of specialists prepared to go that ‘Extra Mile' to ensure each job is carried out within the agreed time-frame and budget. Our team has accumulated over 30 years experience working within the Hotel and Leisure industry throughout the UK and Europe. We pride ourselves on our professional approach to each project ensuring complete honesty and integrity. Our 22000 sq ft warehouse has a sophisticated stock control system enabling real time traceability on all lines stored on behalf of Hotel Groups. 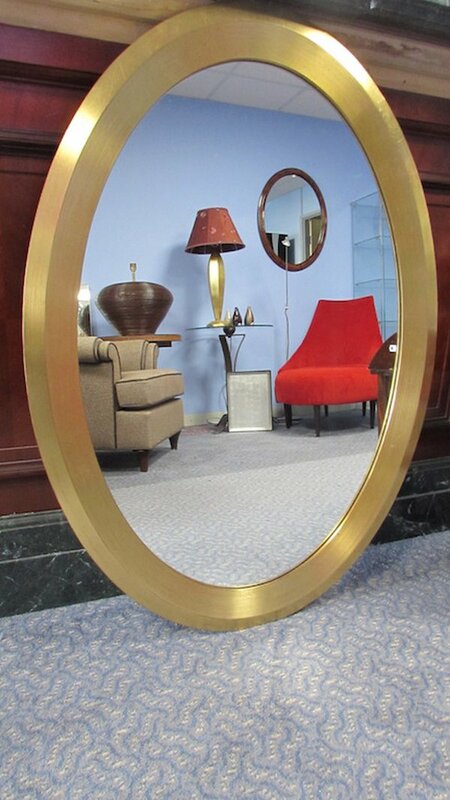 Gilded oval mirrors that are so clean in their design that they are going to suit most interiors. Could be hung portrait or landscape depending on your taste. Hope the reflection’s kinder than the image in Snow White. Shiny, shiny, shiny. Good quality chrome rails with that 30’s twist to their design. Wall attached and with their simple design never going to go out of fashion. Ready for you to neatly fold your classic white towel over the bar or contrast with a bold primary colour. 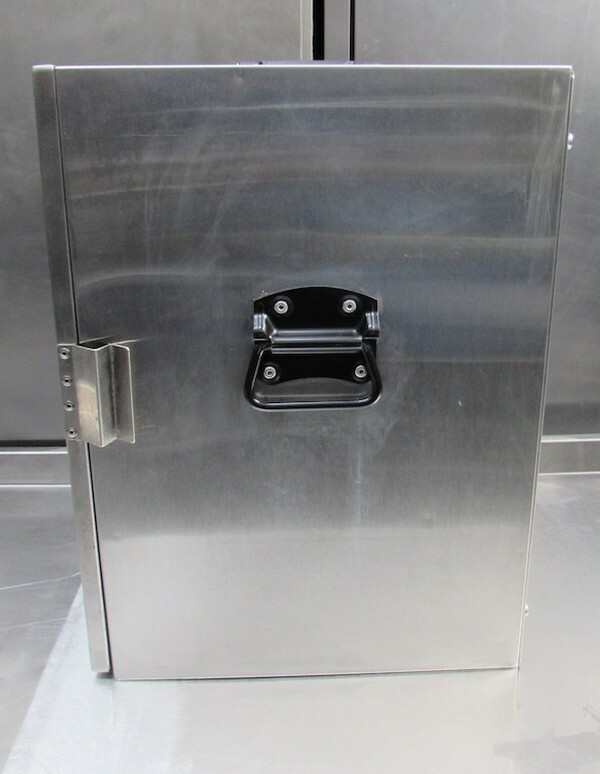 Heated cabinets with an outer casing of stainless steel and insulated interior. Has handles at the top and sides for exceptional mobility. The interior consists of 3 shelves. Each cabinet has it’s own lead. Sold as seen. 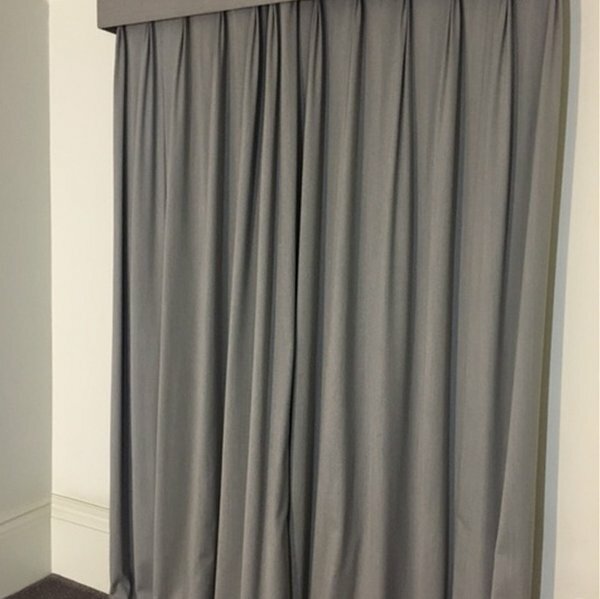 Sleek and stylish cotton mix grey curtains. So neutral and tailored that they are really going to fit into any scheme that’s flitting through your head. So Get Smart and I don’t mean the TV programme. Various sizes. Bit fancy these. A kind of cross between an urn and something mansion grand. Made up of composite materials. Topped off nicely with a finial. Shown in a bedroom but really ideal in a more drawing room setting etc. Rather contrasting fabrics and patterns make up this two-seat sofa. The deep emerald green in is in a chevron patterned velour and cushions in a golden twig design. All very nature colours and shapes combined make this compact sofa very suitable for the Greens amongst us. Various sizes so really could stack as desired. Solid wood frames with interior back mirror. Rather smart and double the look of how many bottles you actually have. 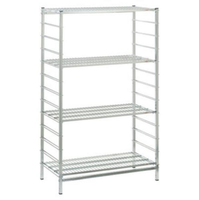 Suppose it could be used in a residential situation as well stacking other things. Thinking outside the box. These foot-stools are ideal as a separate little seat as well, thinking those extra people turning up uninvited and you’ve run out of seats. Otherwise just a simple lined fabric foot-stool to place your feet or a broken one perhaps. Metal brushed aluminium legs fabric, beige and brown cord. 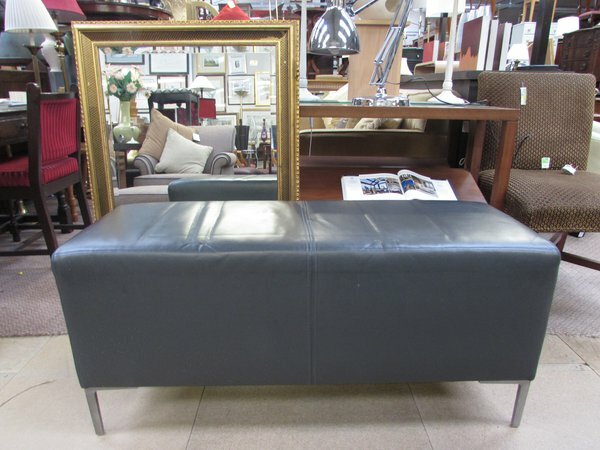 Well designed very angular two seat sofa, could easily seat three tbh. A neutral antique gold background fabric with evenly distributed embroidered maroon leaves. Very comfortable and in superlative condition. Going to feel awfully regal on this one so get the tiara out, make sure the Queen approves it first if borrowed from Her Maj’. Recently removed from a famous 5 star Leicester Square Hotel. These pale grey woollen chaise longues are beautifully simple in their design. Perfect for just relaxing with a good book. 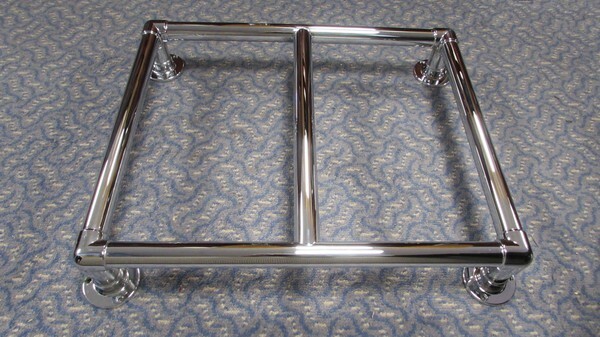 Nicely curved chrome rails as feet, keep with the smooth lines of this timeless piece. Imagine how vibrant a scarlet mohair rug would be draped over this. Contemporary in design these grey leather benches are always handy as extra seating. Could really be used as tables / benches for dual purposes in smaller spaces. The simplicity really means that they’re not going to date fast so handy for commercial use not just residential. New solid wood conference table with a brass inlay around the edge. This piece comfortable seats 8. 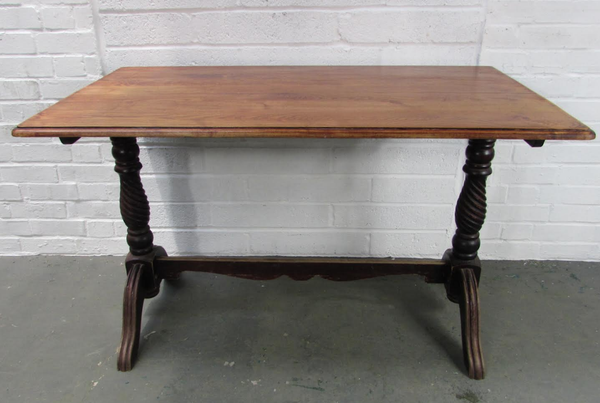 Rather a classy piece that could, at a push, be a dining table as well. Mind you’d need long arms to get to the centre of the table. Very sturdy and a clean design. Ready to confer something political anyone. 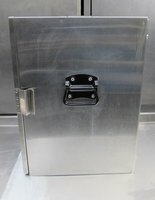 A serious piece of machinery for your paninis etc . Modernist in design. These leather chairs are supremely comfortable and covered in an attractive burgundy colour fitting with the design time frame. Set on chunky legs that fit in with the overall symmetrical design…. sounds like I’m describing a person. 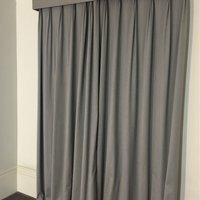 Very comfortable and suitable for both commercial and residential. 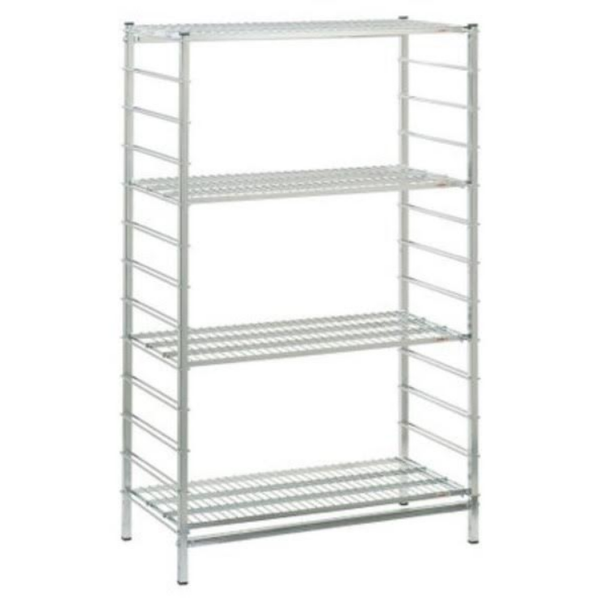 Classic catering shelving . Equally good in commercial , residential or retail . Rather beautiful in its simplicity and great for the chef who wants to see things and straight to hand . 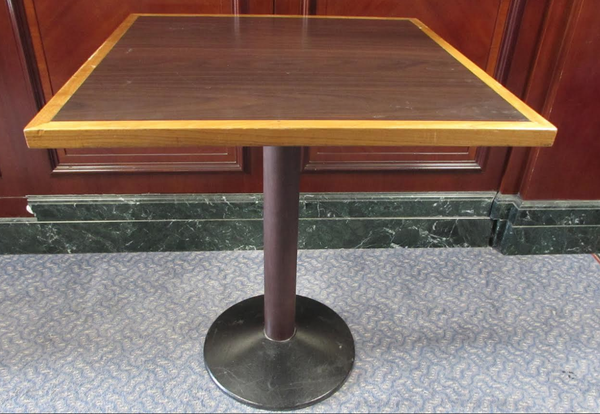 Classic square top wooden café tables set upon a metal circular base. Nicely detailed tops with two-tone wood, sounds like the old music label. Could seat 4. Perfect for your Hipster café just set the tone with, ska, two-tone and reggae, set to go. Latte anyone. Simple, stark, clean, modern. 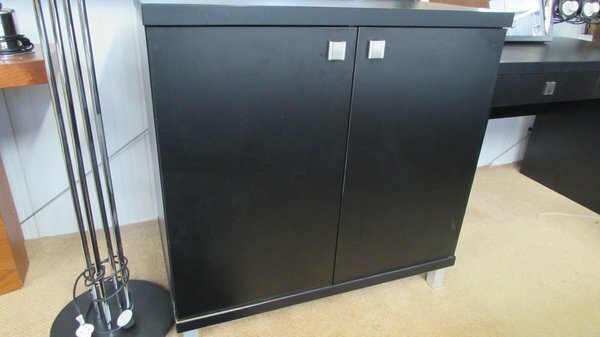 Just a two door cupboard with a single shelf. 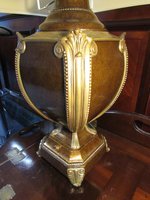 Always handy for hiding away those pieces that you don’t want to be displayed. Going to work in a residential, commercial or office environment.